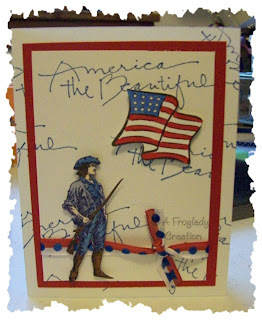 Stamping Stuff: America The Beautiful! I had this soldier in my stamped images pile so I apologize I do not know where he is from. I colored him in with my Copic markers in C3, E37, E50, and B24. For the Flag I used R29 and B24 Copic markers. Then I got out my Prussian Blue Palette Ink to stamp the America The Beautiful sentiment from Printworks. 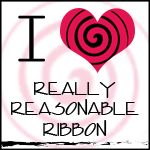 The ribbon is from my Monthly Ribbon Club (reallyreasonableribbom.com) which I love! Tell her I sent you if you join up or give it a a try. 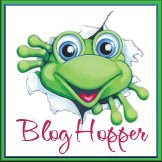 The paper is from Hollo's and the Paper Place. The soldier and the flag are mounted with my black Super Sticky dots from Jody's sale. Gosh I love those things! I am waiting for my June batch to come still and it is already July so I am watching for the new one LOL! Never can heave enough sticky stuff! Wishing you all a Happy Fourth of July in the States - America is Beautiful! Happy day to everyone else stopping by!